Ryan Wilke is a Senior Product Designer at Codeship. Today we’re rolling out some improvements we’ve made to the UI and UX of the Codeship application’s navigation, organization dashboard, projects page, and build pages. But that’s just the tip of the iceberg. 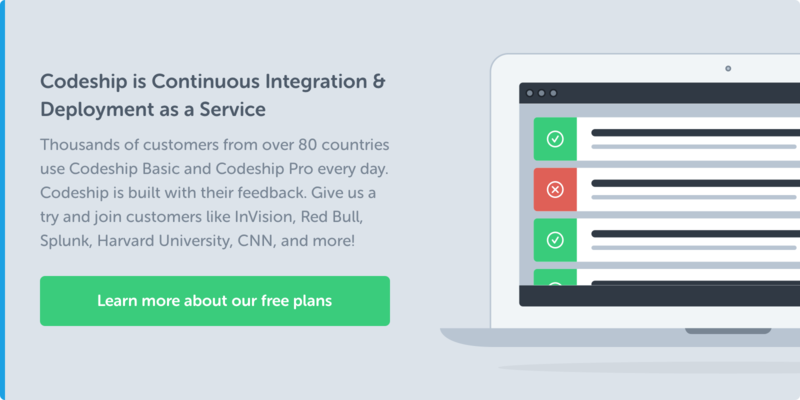 You might say that continuous integration and deployment is the cornerstone of our development philosophy at Codeship — one that’s deeply woven into each iteration we make of our product. That said, there comes a time when it’s healthy to take a step back and look at the bigger picture of where we are now and where we want to be in the long term. As a startup, that needs to happen on a regular basis in order to keep pushing the product and the company to the next level. We recently had one of those moments; here’s how it unfolded. About six months ago, we took a step back and discussed some of the core problems that we were experiencing with the design and user experience of the product as a whole. We covered the entire gamut of topics, which ranged from onboarding issues for new users, to confusion that users were having with their subscriptions, to more complex, build-related issues that our power users had been experiencing and new features they’d been clamoring for. After discussing these issues, it became apparent that we needed to draft an outline to determine where we wanted to be in the next six to twelve months and how we planned to address each of these issues as we moved in that direction. If you don’t know where you’re headed, then you can’t truly know when you’ve arrived. Set your course now and face the challenges along the way. As we transitioned into the design stages, we took a lightweight, mobile-first approach, and spent the first few weeks developing wireframes and clickable prototypes (using InVision) and making small iterations after collecting feedback internally. By the end of the design process, we had a much clearer idea of where we wanted to be in the next twelve months. We knew we had a long road ahead of us, but what made the difference was breaking up the larger initiative into smaller projects. This allowed us to build momentum with smaller releases, and stay true to our continuous integration and deployment philosophy. Today’s release is essentially laying the foundation for the design iterations and features that lie ahead. Our customers have played a central role in getting us to this point, and we greatly appreciate all the input that each of you has shared with us along the way. Ultimately, the goal of our design is to make it easy to find the information most relevant to you as quickly as possible, whether that’s on your giant monitor(s) at work or on your mobile phone at home. At the end of the day, we want to improve your workflow so you can continue shipping better products, faster. So hold onto your hat — there’s a big wave of improvements coming your way. As always, if you have any feedback or suggestions, we would love to hear from you. We can’t express enough how important your feedback has been in shaping the changes we’ve released today, and any iterations we make to our product in the future. If you want to keep up to date with new features roll-outs or other announcements feel free to join our newsletter list below.